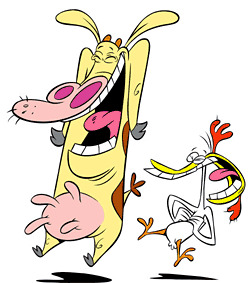 Cow and Chicken are brother and sister, who have human parents whose faces are never seen in an episode. In the pilot episode No Smoking, their bodies have no upper halves. In episode “Cow and Chicken Reclining”, when Cow is digging in the closet and pulls out what would be their upper halves, she refers to them as her science project. And in the same episode Dad’s shadow appears with the upper half of his body cut. In episode “Which Came First” when Mom sits on the TV and laughs, her body appears to have an upper half. The creators were faced with the question of whether and how to explain this scenario. David Feiss approached this problem in the series’ opening title sequence: Mama had a chicken/Mama had a cow/Dad was proud/He didn’t care how. 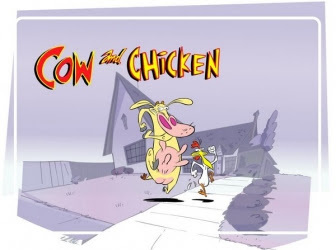 This is all that is ever offered in explanation, though there is one hint in the episode “The Day I Was Born” that Cow is adopted, and Chicken’s paternity has been talked about in episode “Which Came First?”, when Mom sits on an egg and says: “Oh boy, this brings back memories!”. Cow and Chicken’s extended family consists of various other types of animals, including Cousin Boneless, who is a boneless chicken (unable to walk or get up from the floor); Snail Boy, a Snail, Cousin Black Sheep, a Sheep, and Sow, an evil pig. The story takes place in Witchita, Virginia. They also have an uncle Longhorn Steer, who appears in “Professor Longhorn Steer”. 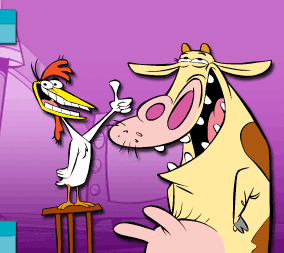 The episode “Happy Meat” also showed the ghosts of a pair of Cow and Chicken’s ancestors, a male farmer married to a female chicken.